What is Be Flea Free Shampoo? 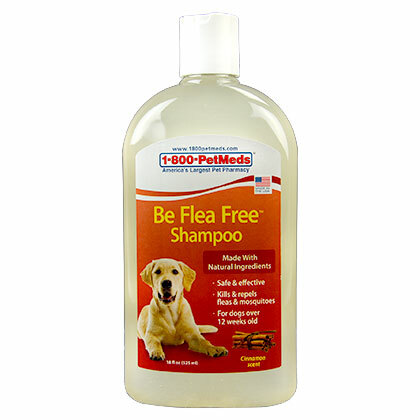 1-800-PetMeds Be Flea Free Shampoo contains natural ingredients that kill and repel fleas and mosquitoes on contact. Natural oils from rosemary, peppermint, clove, and cedarwood make this product a great alternative to other shampoos containing harsh chemicals. Be Flea Free Shampoo also soothes your dog's skin with vitamin E and lanolin. 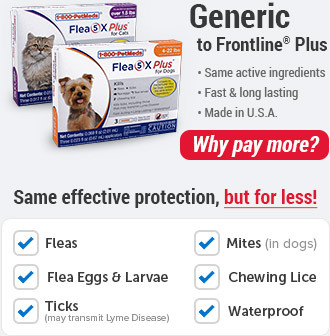 Try 1-800-PetMeds Be Flea Free Spray for continuous flea control in between baths. Not available in the following states: IN, KS, NM, WA. Since 1960, cedarwood oil has been registered as a pesticide by the EPA. This ingredient is commonly found in many flea control products because it is believed to be less toxic than other pesticides, but it is still effective in repelling insects, including fleas. Peppermint oil is also a natural repellent against fleas and mosquitoes. The cinnamon and rosemary oils leave your dog's coat smelling fresh and clean. 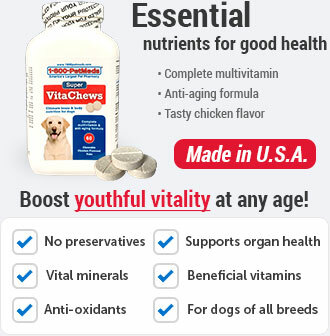 This product is safe for dogs over 12 weeks of age. Purified Water, Anionic Surfactant, Natural Pure Essential Oils: (Cinnamon Oil, Rosemary Oil, Cedarwood Oil, Clove Oil, and Peppermint Oil), Xantham Gum, Lanolin, Fragrance, DMDM Hydantoin, Tetrasodium EDTA, Lecithin, Wheat Germ Oil, FD&C Caramel, Vitamin E.
Be Flea Free Shampoo is a natural shampoo that kills fleas on contact. It also repels fleas and mosquitoes with natural peppermint, clove, cedar, and rosemary oils. Be Flea Free Shampoo soothes skin with lanolin and is safe enough for sensitive skin and is specially formulated for a pet's skin pH so it will not irritate skin as human shampoos can. Be Flea Free Shampoo does not remove topical flea and tick medications. 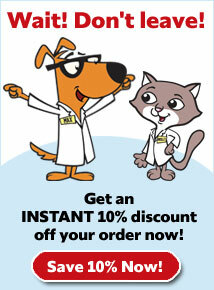 1-800-PetMeds Be Flea Free Shampoo is a non-prescription (OTC) product. Using warm water, wet pet's coat thoroughly. Apply shampoo from tail to head and gently massage deep into coat and skin. Allow shampoo to remain on pet for at least several minutes. Rinse thoroughly with clean, warm water. 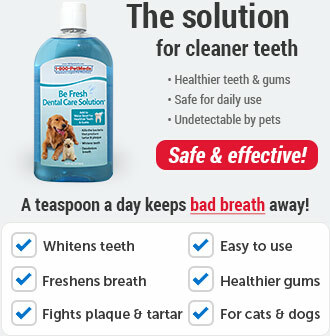 Use as often as necessary to control fleas. Be Flea Free Shampoo is for use on dogs over 12 weeks of age only. Avoid contact with pet's eyes. This product is for external use only. Contact a veterinarian or veterinary emergency room. 1-800-PetMeds Be Flea Free Shampoo safely and effectively rids your pet's coat of fleas and mosquitoes. 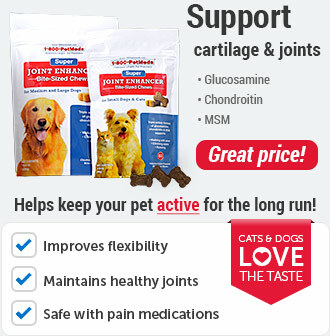 Safe for dogs over 12 weeks old. Wait one day after applying flea preventatives before you shampoo your pet. Using warm water, wet pet's coat thoroughly. Apply shampoo from tail to head and gently massage deep into coat and skin. Allow shampoo to remain on pet for several minutes. Rinse thoroughly with clean, warm water. 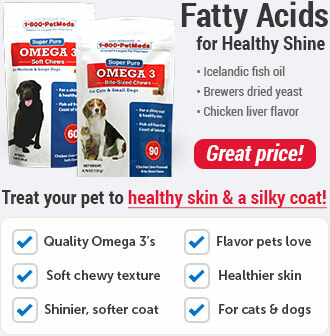 Use as often as necessary to control fleas. This product should be stored at room temperature. Purified Water, Anionic Surfactant, Natural Pure Essential Oils, Cinnamon Oil, Rosemary Oil, Cedarwood Oil, Clove Oil, Peppermint Oil, Xantham GumLanolin, Fragrance, DMDM Hydantoin, Tetrasodium EDTA, Lecithin, Wheat Germ Oil, FD&C Caramel, Vitamin E.